In case you are a passionate plantsman, you will not choose Iceland as an ideal destination for your business trips. For many reasons, there are vast areas of sparse vegetation there and nothing else. A combination of an intriguing plant embedded into an epic scenery, so popular amongst landcape photographers, was of very short supply. For the whole trip, I was dreaming of a shot with a violet lupin field and a huge glacier in the background, lit with early sunlight. 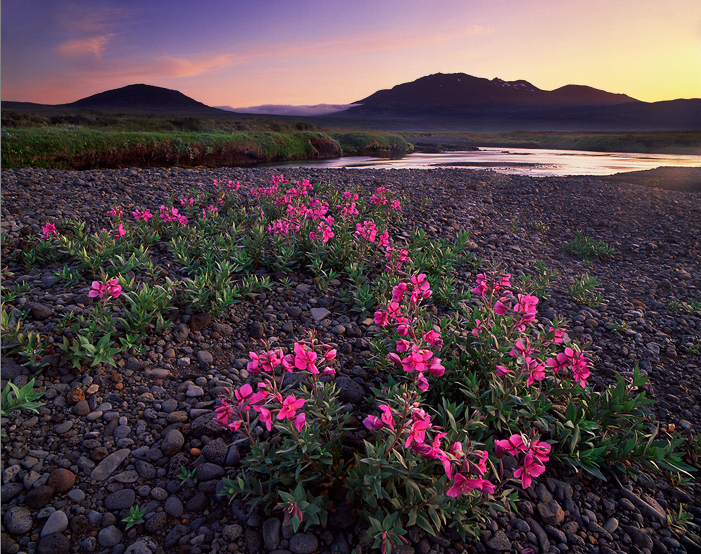 Instead, this is called 'arctic riverbeauty', very typical Icelandic plant that you won't find elsewhere in Europe. I waded the river, lied down and worked out the composition with poor hills, pretty confident that I will get much better flower shot later as we go.